Disney is getting really good at marketing its animated releases in such a way that you really don't have any idea what they're actually about. Pixar's Brave was sold with the slapstick shenanigans of the red-headed triplets; Frozen got a whole lot of similar pre-release emphasis on the naïve Olaf. So naturally, with all of the Big Hero 6 marketing focus on huggable, inflatable robot Baymax, you're not likely to get the sense that this is really a story about the ripple effects of seeking vengeance. In some ways, it's also a pretty standard superhero origin story, focused on an incorrigible orphaned 14-year-old engineering genius named Hiro Hamada (Ryan Potter) encouraged by his older brother, Tadashi (Daniel Henney), to join an elite robotics program. But when Hiro's revolutionary "micro-bots" technology is stolen—with tragic repercussions—Hiro brings the other members of Tadashi's research team together to find the mysterious masked man responsible. And yes, there's that huggable, inflatable robot (Scott Adsit). 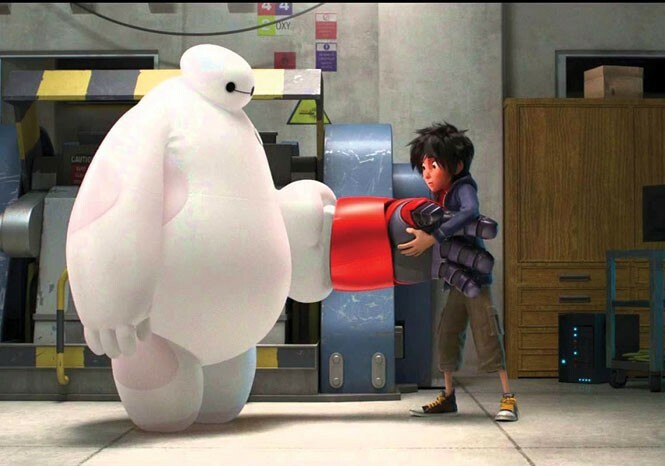 Baymax provides a uniquely deadpan spin on the typical Disney comic-relief character, as a creation designed simply to be a "personal health-care companion" winds up at the center of an action spectacle. The "boy and his dog" relationship between Baymax and Hiro becomes an emotional nexus that's part E.T. and part Johnny Sokko & his Giant Robot, and co-directors Chris Williams (Bolt) and Don Hall (Winnie the Pooh) prove to be an ideal team for that dynamic. Just be aware, parents of young kids, that Big Hero 6 gets pretty intense as it digs into wounded people causing suffering while trying to ease their own pain. The filmmakers miss an opportunity to really explore their setting of futuristic "San Fransokyo," or give the other team members much to do beyond stock types. But there's still that classic, old-school Disney bait & switch: sell the cute, deliver the dark.